Daisy’s Garden products were born out of love for family, nature and holistic living. The product line is formulated from recipes of one family. It all started with a mom who had a passion for creating home remedies and beauty aides from herbs, aromatherapy and oils from the earth. Her oldest daughter, Daisy, was in search of products to use in her natural hair salon, Peezyheadz. 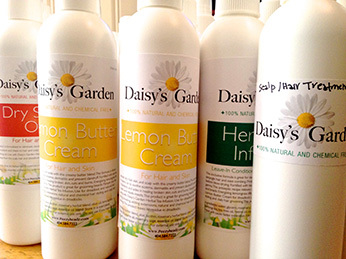 Daisy was in need of a product line that supported her salon’s non-toxic concept. Marcy decided to help her daughter by creating a chemical-free product line, Daisy’s Garden, customized to address the distinct needs of the natural hair care industry. The product line is unique in many ways and would prove to be popular at Peezyheadz. The aromatic scent of lemongrass has become a signature part of services at the salon. Many clients have reported stories of diminishing skin conditions and severe dandruff clearing up and other healing transformations after using products from the line. The people’s love for the product created a demand for this mother daughter team to mass-produce Daisy’s Garden making it available to the public. We guarantee premium ingredients. Daisy's Garden believes in living clean. Our products are made onsite with all natural ingredients. You can count on our products being sulfate and paraben free. You will never find alcohol, petroleum or any other toxic ingredients in our products.